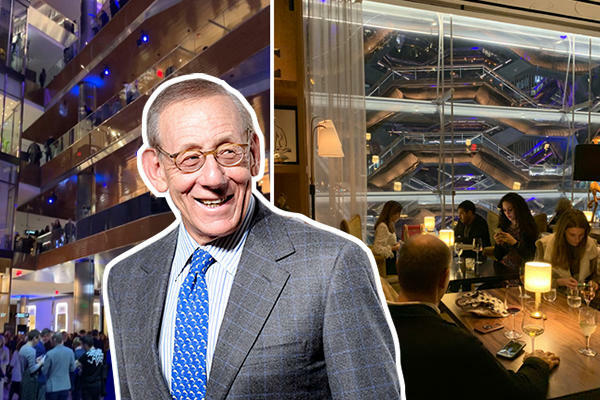 On its opening night, the glittering new mall at Hudson Yards resembled more of a circus than the Far West Side’s newest retail destination. Related Companies CEO Jeff Blau was seen early in the night making the rounds, receiving congratulations for hitting the milestone at the $25 billion project his company developed with Oxford Properties Group. Industry power players including GFP Real Estate’s Jeff Gural and Jane Gural-Senders, Two Trees Management’s Jed Walentas, developer Harry Macklowe, L&L Holding’s Rob Lapidus were among the thousands of guests — making the night the largest gathering of real estate figures outside the Real Estate Board of New York’s annual gala. HFZ Capital’s Ziel Feldman said the opening of Related’s project is part of the “rejuvenation, the creation” of Manhattan’s West Side. Cushman & Wakefield’s Doug Harmon and Adam Spies, Newmark Knight Frank’s David Falk, SCG Retail’s David Firestein and Dolly Lenz were among some of the top brokers who made appearances. Well-stocked and brightly lit shops opened around 6 p.m. as invite-only guests started pouring into the seven-story complex, which is anchored by the first Neiman Marcus in Manhattan. Outside, spotlights danced across the building’s façade and cars pulled into the driveway to drop off and pick up passengers – bringing to life the public plaza that until just a few days ago was a working construction site. “This is like Sim City on steroids, but real,” said Sharif El Gamal of Soho Properties. He added the developers would need enough interactive experiences to generate foot traffic for the retail stores. At least on opening night, immersive retail appeared to be the theme. Athleta on the third floor had live mannequins in the windows: women in sportswear moving in and out of yoga poses in tandem. Michael Pennock, a broker with Corcoran, got a facial on the second floor of Neiman Marcus. He stumbled upon skincare and beauty retailer C.O. Bigelow’s area, thinking that guests were receiving a shave. “It was lovely,” he said afterward. He and Douglas Albert, also of Corcoran, said they appreciated the glamour and exclusivity of the mall. Not everything went off without a hitch, though. Several escalators appeared to have broken down at different points in the night. And not every shop was ready for its debut. According to Related, 90 percent of the shopping center’s space is leased, and 85 percent was up and running by Thursday. As for the larger complex, roughly 82 percent of the office space is either leased or sold. “It’s nice to see a mall with this much energy,” said Ilan Bracha of Keller Williams NYC. The test, he said, would be in sustaining interest. “Who knows, will it become like Brookfield?” he added, referring to the atmosphere at Brookfield Place downtown. Next, the developers are planning another 6.2 million square feet of mixed-use buildings at the second phase of Hudson Yards, which is expected to be completed in 2024. Additional reporting by Hiten Samtani and Kathryn Brenzel.